Kingdom Hearts Unchained χ Launches In Europe Tonight! This afternoon's Square Enix Presents stream has confirmed that Kingdom Hearts Unchained χ will finally launch on Android and iOS in Europe tonight at midnight Pacific Time! 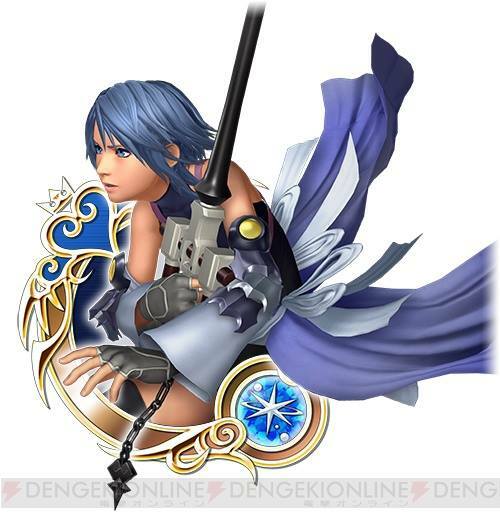 To celebrate the game's launch, players in North America and Europe will all receive a free medal based on Aqua's appearance in 0.2 Birth By Sleep! Don't forget that you can still join our official KH-Vids parties for Unchained χ here! With a demo out in addition to the latest trailer, eye-catching info on 'Kingdom Hearts HD 2.8 Final Chapter Prologue' has been firing out lately, hasn't it? Nomura: We've said for a while that we were planning it for 2016, and work is going according to that plan. As there was a little wait before this opportunity to release new information, I know some people were saying they were worried, but everyone can rest assured that we are not behind on the development schedule. We got to experience firsthand the E3 version of the demo. 'Kingdom Hearts 0.2 Birth by Sleep -A fragmentary passage-' in particular has a big impact, doesn't it? Nomura: 0.2 BBS is, as I've said, a completely new title, and it does have a special feel, being the first new title on a non-handheld console in a while. The scene you saw in the new video was the opening of 0.2, and from there, a huge story development connecting the past and present is still waiting. The footage was from the demo version, so it will be possible for you to enjoy that quality of action in reality on the PS4. How big are you planning to make 0.2? Nomura: I believe I've said this in previous interviews, but we are imagining about the length of what in other titles in the series so far would be considered one world's worth. However, it does depend on how you perceive 'one world's worth'. The other day during work on KH3 I checked one world from start to finish, and it was longer than I expected. For the time being, I guarantee that 0.2 BBS will be of a size that you won't be done with so easily. The castle in the latest footage released is the Castle of Dreams (Cinderella), right? Would we be correct in thinking of 0.2 to be basically the same as KH3 in make? Nomura: Yes, you would. From the engine that serves as the base, to all of the rendering, it's the same as KH3. The battle gameplay is also based off KH3, so it's shaping up to be content in which you can feel a piece of KH3. Of course, the full-volume KH3 will involve lots of other gameplay. The graphics in 0.2 look dramatically different compared to that of past titles, don't they? Nomura: I think perhaps the biggest reason for that is that 0.2 BBS and KH3 utilize lighting in the rendering. In the titles in the series so far, we had been trying not to use lighting in our rendering. When we decided on the graphics of KH3, we took great pains to find a balance between the characters and the backgrounds. As for the feel we got from our chance to play the E3 demo version of 0.2, our impression was that it was something like a mix between KH2 and BBS. Nomura: The base of the battle gameplay is inherited from KH1 and KH2, with added components that were also in BBS. The character you control is Aqua, and you no longer use Deck Commands like in BBS, and magic works through the 'consume MP' system. One thing that left an impression on us in the 0.2 demo was the magic, which sets off various added effects upon hitting the enemy. Nomura: Blizzard freezes enemies, thunder shocks them. There are effects on the terrain, too. For example, upon being hit with blizzard, tracks of ice will remain on the ground, and you can ride them by sliding along. In the new title, magic is not an element that is done with once it has hit the enemy; there are several ways like this in which you can set off a chain reaction. I think it is one thing that will make the action carry more depth. The maps had a lot of platforms of different heights, and it really felt worth exploring them. Nomura: That's something we put a lot of thought into. In early footage of KH3, there's a scene where Sora jumps down from a cliff. Apparently that was particularly popular among fans overseas. In both 0.2 BBS and KH3, we have been putting a massive amount of thought into the platform heights on the maps overall. In the game, however, there are heights that unintentionally give me the shivers. The staff thought of so many elaborately structured maps for KH3D, too, so please look forward to the ones in the new title. Now that we've played the 0.2 demo, our hopes for KH3 have gotten even higher, whether we want them to or not. Nomura: For that exact reason, I would love for you to play '2.8 FCP'. At E3 this time we released comparatively new pieces of news, which is why I think perhaps the new-title-ness was so palpable for you. If you want to enjoy the last chapter to the fullest, KH2.8 is unmissable! Putting Kingdom Hearts Dream Drop Distance HD, a game that was originally on two screens, onto one screen required input changes, didn't it? Nomura: There was a lot of trial and error involved in that remake, for sure. Perfect examples are the Link System and Reality Shift, which required touch and drag controls on the bottom screen, but these have been changed to different controls, such as simultaneous button presses. At first, we had plans to use the Dualshock4 touchpad too, but after consideration, we settled with button controls. Are the battle sections the same as the original version? When we played the E3 version of KH3D, Side Sora, we were accompanied by an unfamiliar dream eater…? Nomura: That is Catnuki (Tanuki-style Meow Wow). One of the new elements we have added is several new types of dream eaters to be your friends. There is one more title included in 2.8, Kingdom Hearts χ[chi] Back Cover. When we watched the latest trailer, we were surprised. We hadn't thought it'd be a title that showcased so many characters to that degree. Nomura: As the clips we released in the early days focused on talking, maybe it made people think that the whole thing would be like that. In reality, just as you saw in the newest trailer we released recently, lots of characters appear, and there are battle scenes and the like. As you'll understand if you watch it, the graphics of Back Cover are made the same way as KH3. Does Back Cover tell the story of the things happening behind the scenes in χ[chi] and Unchained χ[chi]? Nomura: Kingdom Hearts χ[chi] and Kingdom Hearts Unchained χ[chi] tell the story from the viewpoint of the Player (a keyblade wielder), and Back Cover tells the corresponding story from the viewpoint of each Union's leader (Foreteller). While the Player was doing things in χ[chi] and Unchained χ[chi], what were the Foretellers thinking and doing behind the scenes…? If you've played χ[chi] or Unchained χ[chi], I am sure there will be scenes matching timeframes that make you think, wait, isn't this that scene…? About how long is the Back Cover cinematic, in the end? Nomura: It's about over one hour in total. Compared to the cinematic works included with past HD titles (358/2 Days and Re:coded) it's short, but Back Cover's story is a completely new episode, so there are plenty of highlights. It's amazing that of the three titles included in 2.8, two are completely new, isn't it? Nomura: From the production side of things, I want people to see 2.8 itself as a new title. Two thirds of it is new work, which is why we didn't call it 'HD 2.8 ReMIX' like the other titles so far. Content-wise, the game truly is the prologue to the final chapter (KH3), so I would love for those who want to enjoy KH3 to the fullest to play 2.8. 0.2 in particular has graphics and battle gameplay based on KH3, so it allows you to experience a game extremely close to KH3, right? Nomura: To take that logic to its extreme, it means you can set out on the journey of KH3 within the year (laughs). The KH3 I had first envisioned got too big volume-wise, so I cut the details between the new journey and KH2, and KH3D and 0.2 BBS were born. Back Cover also contains setting-up that connects to KH3, so 2.8 truly is positioned as the prologue to KH3. What developments will you be able to show us between E3 at the release date of KH2.8? Nomura: Around autumn, as we head for the December release date, I think I will release information at fixed intervals. I also want to create an opportunity for Japanese gamers to try the demo. Also, in August, the KINGDOM HEARTS Concert -First Breath- tour will begin. Game information won't be coming out there, of course, but it's the first official concert of the series. I really hope fans will come. I am thinking of something elaborate and refined for the organization and production, with next year's world tour in mind. By the way, in KH3D, characters from The World Ends With You appeared, right? I am sure the number of fans hoping for a next development of TWEWY isn't small, is it? Nomura: TWEWY has many fans overseas, too, and with such high regard from so many of those who played, I've been asked many times by those overseas to make a direct sequel. It's not a simple matter just because it did so well in the past, but the staff are all looking for a solution, so I won't say it's impossible. At the end of the latest trailer, we heard that a follow-up on KH3 will happen his winter. I had them put that one sentence in there because I felt bad for all those who had high hopes for KH3 news, but right now I definitely do want people to pay attention to 2.8, whose release date has been announced. After I've gotten it across that the position of the content in 2.8 is important, I think I will report new information on KH3 along with the release of 2.8. With this announcement regarding 2.8, I hope you now understand that work on KH3 is progressing well, and please look forward to this winter. The release of the new 'Kingdom Hearts 2.8' trailer today provided fans with many surprises. One of those surprises was finally getting a feel for what to expect from 'χ[chi] Back Cover', showing us characters from χ[chi] in cutscene form with spoken dialogue. One of the characters shown in the trailer was Ephemera, whose voice sounded familiar for some. A fan then asked actor Michael Johnston of Teen Wolf fame on Twitter whether he voiced the character, and he pretty much confirmed it. 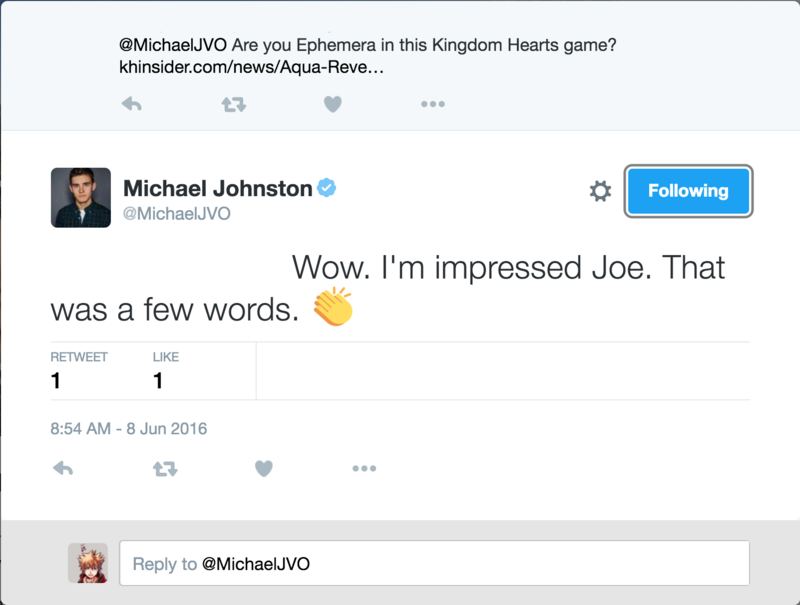 The tweet has unfortunately been deleted (most likely due to a NDA Johnston signed), though Johnston still retweeted a fan asking him about voicing Ephemera, which pretty much guarantees that he is the voice of Ephemera in 'Back Cover'. The official Kingdom Hearts Twitter account announced this morning that Kingdom Hearts Unchained χ will be coming soon to iOS and Android users in Europe! Unchained χ is a port of the Japan-exclusive browser game χ [chi], following the story of Keyblade wielders fighting against the darkness in a time before the Keyblade War. The browser game launched in July 2013 and will close its services this September. Unchained χ launched in Japan last September and in North America in April. Remember, anyone playing Uncahined χ can still sign up to join our official KHV parties here!